The 2018 Maple Weekends brochure listing 17 sugarmakers, four pancake breakfast sites, the American Maple Museum and the Fourth Annual Maple Sap Run and Walk in Jefferson, Lewis, Oneida and Oswego counties is now available. Send a self-addressed, stamped, letter-size envelope to Steve Rogers, Bear Creek Farm, PO Box 853, Pierrepont Manor, NY 13674 to receive a free brochure. The 2018 Maple Weekends are March 17-18 and March 24-25 with sugarmaker open houses, tastings, sugarbush tours, and activities from 10 am to 4 pm across the four-county region. Visitors experience first-hand how real maple syrup and maple confections are made, see sap boiling demonstrations, and find a variety of pure maple products for tasting and purchase. 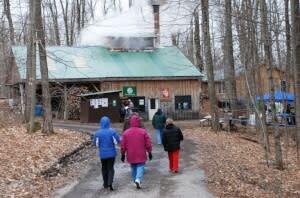 Visitors are encouraged to wear appropriate clothing and footwear for winter season and sugarbush tours. Listings in the brochure identify which sugarhouses are only open on Saturdays and those only open one of the two weekends. Tastings and tours are free at most sites. Driving directions to participating sugarhouse sites are posted at mapleweekend.com. The 4-county 2018 Maple Weekend brochure lists four sites serving pancake breakfasts, and the 4th Annual Sap Run 5k Race and 3k Walk set for March 24 in Mannsville in southern Jefferson County. The 2018 Maple Weekends brochure for Jefferson, Lewis, Oneida and Oswego counties is also available at county Cornell Cooperative Extension offices and is posted on the New York State Maple Weekend website at https://mapleweekend.nysmaple.com/local-brochures/.